This morning I am sitting at our shared desk in our shared "office" drinking breakfast tea and listening to music. To my left is our cat, Mombi girl, laying as flat as she can possibly get, tail slightly twitching, staring out the window at an unsuspecting bird. Mornings don't get any better than this. I mean, I guess for the bird- it could be better..but luckily for him/her our kitties are indoor only, and he has no chance of his life really being threatened. At least by my cats. Sometimes, I'm afraid to admit, I can take advantage of what I really have here. I mean, I have been given an amazing opportunity to stay at home (most days) and spend my mornings reading, snuggling kitties, and blogging. Sadly, I get caught up in the "I gotta do NOW" list and forget to enjoy these mornings. Before I know it the day is over, I'm exhausted, certain aspects of work never got done (to which I'm beating myself up for), and I'm in bed struggling to keep my eyes open. I hate those days. But if I'm going to be honest- I have no one to blame but myself. I'm trying to take each day as it comes. Each hour or minute even! To not worry about that darned "to do" list but rather do one thing, focus on it, finish it, and THEN move on to the next. I'm also trying to tell myself that it really is ok if stuff has to be moved to "tomorrow". I'm hoping that by doing this, AND by slowing things down a tad- I'll be able to more adequately appreciate those blessings (big and small) that I have indeed been given. For the record, we're big homebodies. Well...maybe it's just me. Let me restate- For the record, I'M a big homebody. A perfect evening to me would include jammies, tea, our twinkle lights on, cats, popcorn, and a movie....at home. Now don't get me wrong I DO love going out and doing things...as long as it's not too far away and we're home in a respectable amount of time. SOOoOOoOOoo that being said, there was a movie that came out last Friday that we both had been kind of waiting for. Said movie was only playing AT ONE THEATER in our city. ONE. ONE THEATER! Said movie was playing at a theater 40 MINUTES FROM OUR HOME. Sigh. So I put my big girl pants on and went on a date with the hubbie 40 minutes from home, in the heart of Los Angeles...on a Saturday night. If you don't know why being in the heart of LA on a Saturday is a stressful big deal, don't ask. The theater was phenomenal! Gorgeous and all spiffy and such. We both kept saying "Wow!" or "Look at that!" to each other, haha. For example...there were upscale home decorating stores...in the theater...and the popcorn was served in eco-friendly popcorn bags. Knowwhatimean? Sheesh...this little diversion went on a LOT longer than originally planned! It has nothing to do with cake or making sure things don't stick- it has nothing to do with anything this blog was originally supposed to be about! How to Make Sure Your Cake Doesn't Stick to Your Pan! 1. This particular way works for round cake pans. If you're using a square (or rectangle) pan, you can do the same technique, just cut the parchment differently- so it fits the bottom of your pan adequately. You'll need to start off with a piece of parchment big enough for your whole pan to sit onto (this is the best way to make sure you'll have enough). Because I was using 8" round cake pans, I was able to get two pan's worth of parchment out of one piece. 2. Cut parchment so that you have a square about the size of the bottom of your cake pan. 1. Next, take one square of parchment and fold in half, going right to left (or left to right). 2. Fold parchment in half again, this time going top to bottom (or bottom to top). 3. 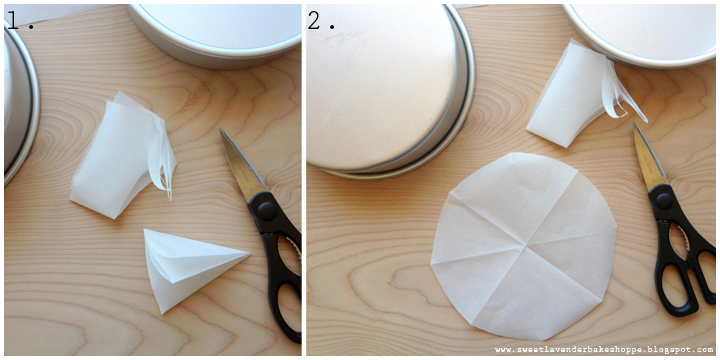 Lay your parchment down, and fold paper up so that you create a tip. You will want to fold from lose ends to the folded crease side. 4. *Optional* Do the same fold again, creating an even stronger point. Again folding from where you have lose ends to the folded crease side. 1. 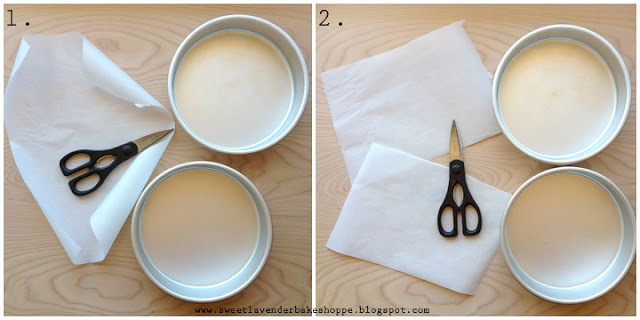 Flip your round cake pan over so that you're looking at the bottom and place point of parchment into the center of pan. 2. Cut along the edge of parchment, continuing to keep that point in the center! 1 & 2. 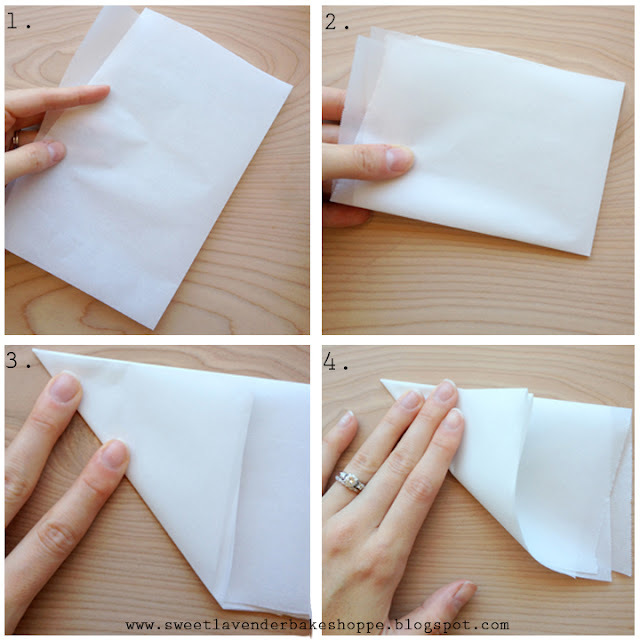 Next, unfold your parchment. You should have a lovely circle that's basically the size of the bottom of your cake pan. 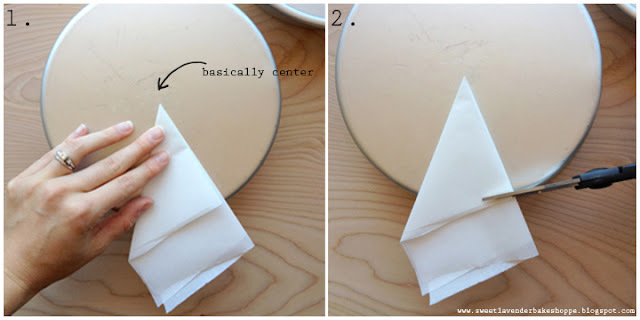 Place parchment circle in bottom of cake pan to check the size. A little smaller round of parchment is A-OK. You definitely don't want the circle to be bigger- if it's creeping up the sides, just re-fold and trim a little off the bottom. Next, spray the bottom (and sides) of your cake pan, sans parchment paper. Place parchment into cake pan and press onto the greased surface so that all of the parchment is "stuck" to bottom. Spray (or butter) once more. In culinary school this was called S/P/S- Spray, Paper, Spray. You're ready to go!! Set aside and make your cake batter as according to your recipe's instructions! When ready to bake, just pour batter in and bake accordingly. 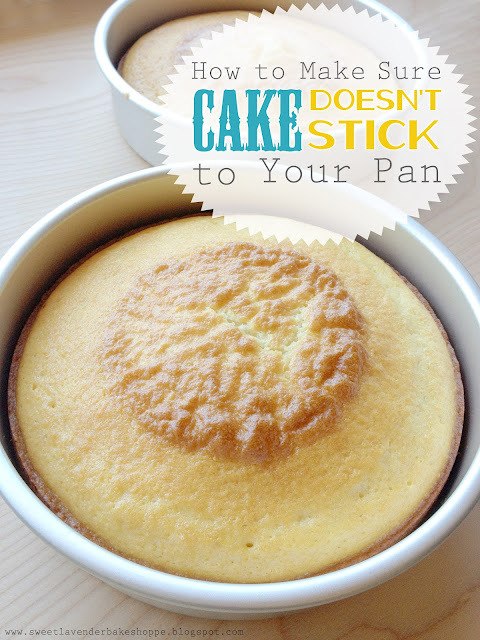 Let cake cool in pan till you're able to touch it comfortably. Then just flip pan over and viola! If the cake isn't falling out, shake very gently and it should do the trick. Make sure you do loosen the sides before hand. Then just peel that parchment off and throw away! There you go- perfectly unstuck cake rounds! * Will work for any sized cake round, just make sure you measure the bottom of the pan to make sure your original parchment is a little bigger than cake pan before folding. Then go about instructions the same! ** As mentioned earlier, this will work for any other sized cake pan (other than round) too...the folding technique will be different though. You'll definitely want to S/P/S any cake pan before baking! I love your posts! 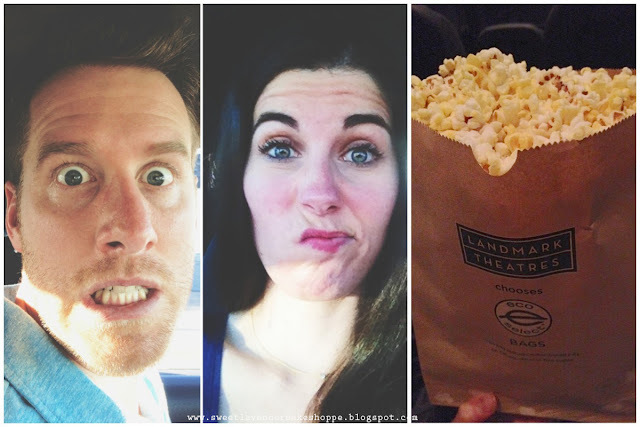 Jammies, curled up with popcorn...is so not lame! It really isn't. Jammie wearing, popcorn eating lovers unite!!!!!! i literally just did this only square from seeing it on tv, but my cake cracked in the center of the bottom do you know how to prevent that?? ?